Owl crafts are just too cute to resist. This super easy owl craft is great for young children, even the youngest of little ones can help if a grown up cuts out the pieces for them! 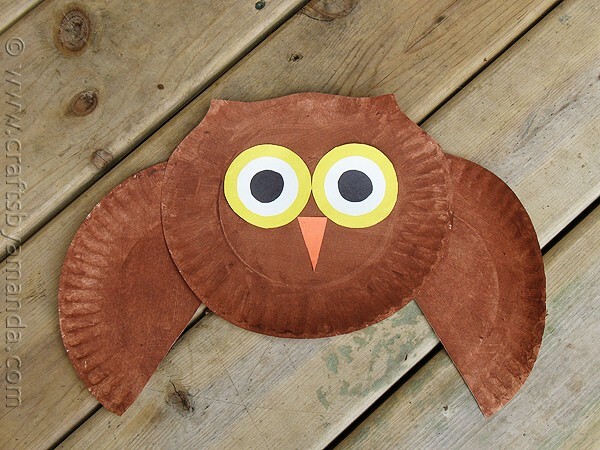 Make this fun paper plate owl with your kids today. This owl is one of the many easy crafts for kids that your children can make any time of year. However it seems that we talk about owls a lot during the fall season. 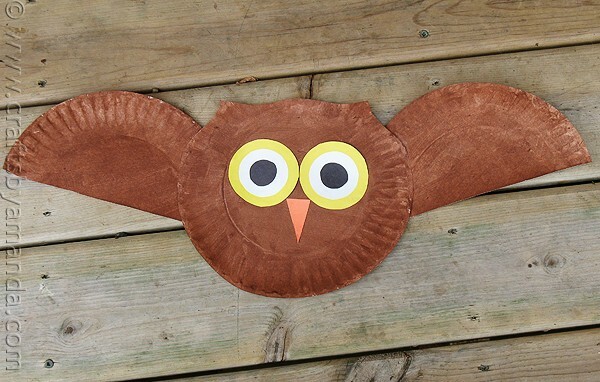 Whether you have an owl unit in school or your kids just watched Harry Potter, this paper plate owl is a great project. Cut out the patterns. Glue the white circle to the center o the yellow circle, then glue the black circle to the center of the white circle. Repeat. Cut one of the paper plates in half for the wings. Trim the top of the remaining paper plate to form two ears at the top. Glue the eyes to the front of the plate and glue the beak directly below the eyes. Glue the wings to the back of the body plate. You can tape a piece of yarn to the back to create a hanger if you wish. I made these Paper Plate Ladybugs years ago and they are still among my favorites. This cute Paper Bag Scarecrow is ideal for fall, and the kids will love making it! How about this darling Cardboard Tube Giraffe? Great for a nursery! And finally, these Plastic Lid Ladybugs are the perfect recycling project. Paint the paper plates brown and let dry. awesome cool projects. can’t wait to try them with my kids at church!!! Thanks Melba, hope you have fun! Found this project at the end of our Owl Week, but we ran out of time and couldn’t do it. Saving it on my Pinterest and hope to do it soon!!! Made the paper plate owl. I thought you might want to know in the directions you say 2 small circles white when it should be black.